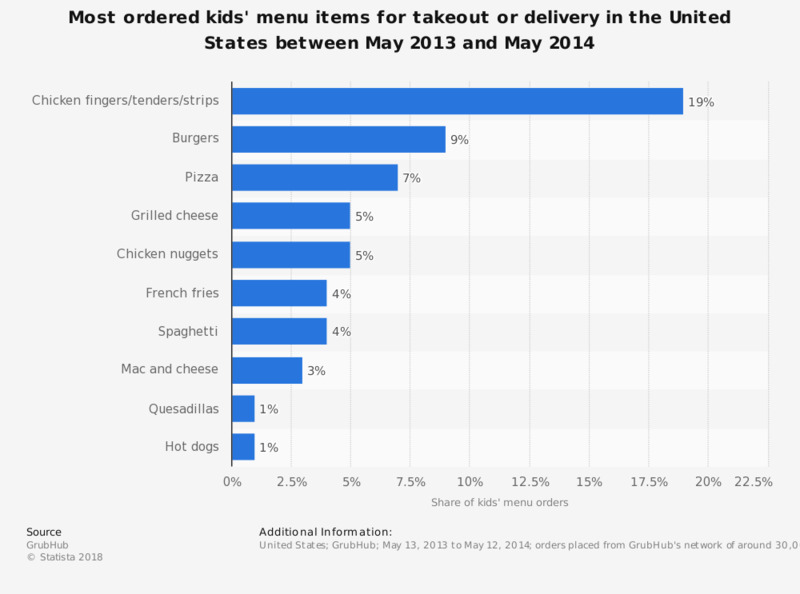 This statistic shows the most ordered kids' menu items for takeout or delivery in the United States between May 2013 and May 2014. The most popular kids' menu item ordered on GrubHub during that time was chicken fingers/tender/strips, constituting 19 percent of all kids' menu orders. orders placed from GrubHub's network of around 30,000 restaurants across the U.S.
Statistics on "Food delivery industry in the U.S."
Typically, when it comes to meals in your home, do you usually cook at home, eat out or order takeout or delivery? Which of these online providers of food delivery have you used in the past 12 months? Have you ever ordered food using GrubHub? Do you have any mobile apps for specific restaurants? Do you tip when you order takeout?